Satirical French magazine Charlie Hebdo is on Wednesday to publish an edition edited by prophet Mohammed, the polemical weekly said, in "honour" of Islam's influence on the Arab Spring. "In order fittingly to celebrate the Islamist Ennahda's win in Tunisia and the NTC (National Transitional Council) president's promise that sharia would be the main source of law in Libya, Charlie Hebdo asked Mohammed to be guest editor," said a statement. 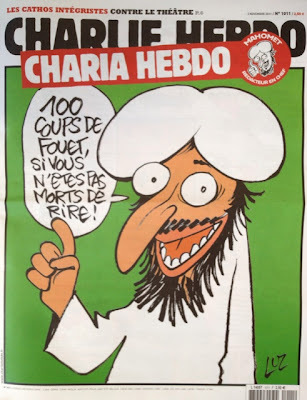 The weekly has been rebaptised Sharia Hebdo for the occasion, and will feature on its cover a picture of Mohammed saying: "100 lashes if you don't die of laughter!" On the back page, a picture of Mohammed wearing a red nose is accompanied by the words: "Yes, Islam is compatible with humour."